Mirror, mirror on the wall, whose picture is fairest of them all? For those who may be curious, in Greek mythology, Argus Panoptes is the name of a giant with 100 eyes. He was the all-seeing guardian that was always awake, alert, and attentive to all that surrounds him. Here at Argus Insights, we’ve developed tools that allow us to identify and accumulate data in a way where we can see what’s going on in the world on many different levels and thus using that to provide the clearest possible insights for what people are curious about. This week’s blog will be focused on the eyes, or eye, of a smartphone. Like many of the other features that can be found on smartphones today, people look to find the best of the best. The most common determinant of camera quality on a smartphone that people pay attention most to is the number of megapixels the camera has. If a few is good then more must be better! This smartphone has 8 megapixels and shoots well, if another smartphone has 16 megapixels then it must be twice as better! Logically this all makes sense, if a car has more horsepower then it’s stronger. So why not choose a smartphone with the highest megapixels? Yes, to a certain extent, the megapixels matter but is only one of many factors that go into producing a quality photo. Below are the top ten smartphone cameras that produce pictures that you, the people, thought were best and most pleasing. The graph shows that, for example, the Nokia Lumia Icon has more than 30% of its consumers expressing satisfaction with only a small percentage expressing negative opinions when it comes to the camera aspect of the smartphone. 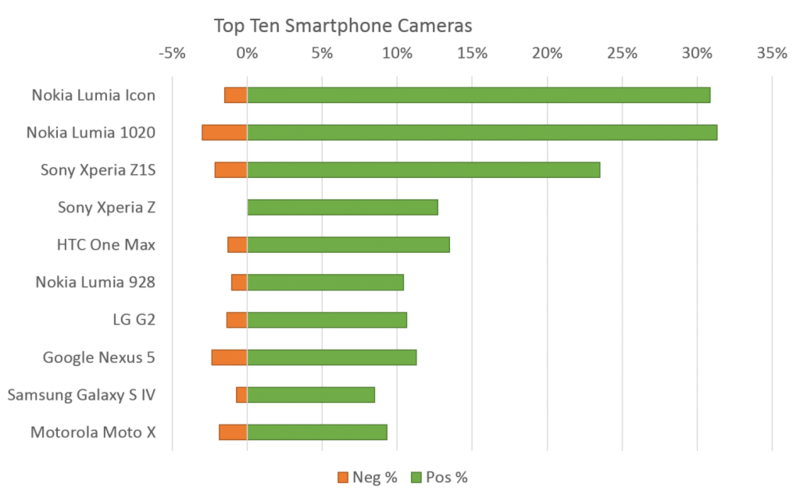 The Sony Xperia Z had the fewest complaints among their consumers in regards to their smartphones camera functionality. In terms of net sentiment, our consumer data agrees that the number of megapixels a camera has is only one of many factors that plays into the overall user delight. The amount of megapixels the camera packs shouldn’t be the only determining factor if you’re looking for a smartphone that produces pleasing images. Sensor size, texture, and contrast are the other factors that come together within a smartphone to produce a picture. Megapixels are like the bigger, stronger, more noticeable older sibling that overshadows their younger siblings whose roles are in fact vital to the overall strength and success of the household. The younger siblings in the camera world are speed, quality of the camera app, HDR and panorama features that come along with the phone. They all work together to provide the user the ability to take fast, beautiful, and clear pictures. Take the HTC One Max, it only has 4 megapixels but produces a quality picture that people enjoy because they decided that instead of cramming pixels, they would engineer their sensors to house larger pixel sizes allowing more light to be captured. The data shows that people are pleased and HTC’s 4 megapixel shooters (or what HTC calls UltraPixels) are the David and Goliath in the smartphone camera world. Reversely with Nokia’s Lumia 1020, they decided to jam pack their phone with a mind boggling 41 megapixels. On average that’s 4 to 5 times more megapixels than other smartphones out on the market. Nokia made an effort to stand out from the competition and they’ve seemingly created a beast. But it’s also worth noting that although it pacts impressive specs, it doesn’t dominate the competition. Although being 4 times in strength it isn’t 4 times as delightful, as seen in our consumer data. This beast, with all its might and glory, is actually a gentle giant. We thought it was peculiar that the Moto X was able to crack the top ten. When the smartphone first hit the market, it was successful in capturing the hearts of people like the way roses do on Valentine’s Day. Unfortunately every rose has its thorns and for consumers, using the camera function on the Moto X felt like touching the thorns on a rose. “If a decent camera is even slightly important, then avoid this phone like the plague.” Since then Motorola has addressed the issue and a recent update made the camera much more user friendly and improved the quality of pictures that were produced. Motorola took the time to repair the crack in their overall impressive armor and the people noticed. For all the smartphone lovers out there who are looking for a phone that shoots well and produces quality pictures, these ten are the ones that stand out in the sea of smartphones on the market. Companies are constantly engaged in wars with each other, which has no foreseeable end, to produce higher megapixel phones to convince the public that their newer model is better than the competition. That doesn’t fool us and it should not fool you either. We listened to the stories you told, the opinions you had, and concerns that you voiced. Driven by power of the people and Argus tools, the insights are picture perfect.